For the French department, see Calvados (department). Apple orchards and brewers are mentioned as far back as the 8th century by Charlemagne. The first known Norman distillation was carried out by "Lord" de Gouberville in 1553, and the guild for cider distillation was created about 50 years later in 1606. In the 17th century, the traditional cider farms expanded, but taxation and prohibition of cider brandies were enforced elsewhere than Brittany, Maine, and Normandy. The area called "Calvados" was created after the French Revolution, but eau de vie de cidre was already called calvados in common usage. In the 19th century, output increased with industrial distillation and the working class fashion for café-calva. When a phylloxera outbreak in the last quarter of the 19th century devastated the vineyards of France and Europe, calvados experienced a "golden age". 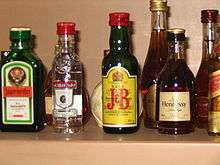 During World War I, cider brandy was requisitioned for use in armaments due to its alcohol content. The appellation contrôlée regulations officially gave calvados a protected name in 1942. 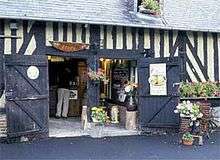 After the war, many cider houses and distilleries were reconstructed, mainly in the Pays d'Auge. Many of the traditional farmhouse structures were replaced by modern agriculture with high output. 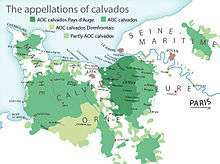 The Calvados appellation system was revised in 1984 and 1996. Pommeau got its recognition in 1991; in 1997, an appellation for Domfront with 30% pears was created. Cider brandy is also made in the UK, and appears in records going back to 1678. Somerset cider brandy gained European protected geographical indication (PGI) status in 2011. Calvados is distilled from cider made from specially grown and selected apples, from over 200 named varieties. It is not uncommon for a calvados producer to use over 100 specific varieties of apples, which are either sweet (such as the 'Rouge Duret' variety), tart (such as the 'Rambault' variety), or bitter (such as the 'Mettais', 'Saint Martin', 'Frequin', and 'Binet Rouge' varieties), the latter being inedible. The fruit is harvested and pressed into a juice that is fermented into a dry cider. It is then distilled into eau de vie. After two years of aging in oak casks, it can be sold as calvados. The longer it is aged, the smoother the drink becomes. Usually, the maturation goes on for several years. The appellation of AOC (appellation d'origine contrôlée) for calvados authorizes double distillation for all calvados, but it is required for the calvados Pays d’Auge. The usual arguments for and against the two processes are that the former process gives the spirit complexity and renders it suitable for longer aging, whilst the latter process gives the calvados a fresh and clean apple flavour but with less complexity. In fact, a growing belief indicates a well-operated column still can produce as complex and "age-able" calvados as double distillation. The AOC calvados area includes all of the Calvados, Manche, and Orne départements and parts of Eure, Mayenne, Sarthe, and Eure-et-Loir. AOC calvados makes up over 70% of the total production. A minimum of two years aging in oak barrels is required. The terroir, geographical area, is defined. 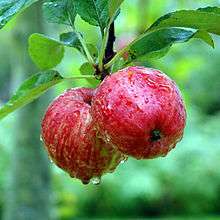 The apples and pears are defined cider varieties. The procedures in production, such as pressing, fermentation, distillation, and ageing, is regulated. Usually, single-column distillation is used. The more restrictive AOC calvados Pays d'Auge area is limited to the east end of the département of Calvados and a few adjoining districts. Extensive quality control, the basic rules for AOC calvados together with several additional requirements, is practiced. Aging for a minimum of two years in oak barrels is required. 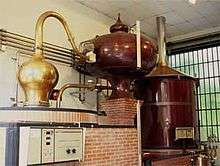 Double distillation in an alembic pot-still is used. It must be produced within the designated area in Pays d'Auge. A minimum of six weeks of fermentation of the cider is required. A small calvados producer around Cambremer along the cider route. AOC calvados Domfrontais reflects the long tradition of pear orchards in the area, resulting in a unique fruity calvados. The regulation is similar to the AOC calvados and the column still is used. Fermier calvados ("farm-made") — some quality-minded producers both inside and outside the Pays d’Auge make "fermier calvados", which indicates the calvados is entirely made on the farm in a traditional agricultural way according to high quality demands. The age on the bottle refers to the youngest constituent of the blend. A blend is often composed of old and young calvados. Producers can also use the terms below to refer to the age. "Fine", Trois étoiles ***, and Trois pommes must be at least two years old. Vieux or Réserve must be at least three years old. "V.O." "VO", Vieille Réserve, "V.S.O.P. ", or "VSOP" must be at least four years old. "Extra", "X.O." "XO", "Napoléon", Hors d'Age, or Age Inconnu must be at least six years old, but are often sold much older. High-quality calvados usually has parts which are much older than that mentioned. Calvados can be made from a single (generally, exceptionally good) year. When this happens, the label often carries that year. Calvados is the basis of the tradition of le trou Normand, or "the Norman hole". This is a small drink of calvados taken between courses in a very long meal, sometimes with apple or pear sorbet, supposedly to reawaken the appetite. 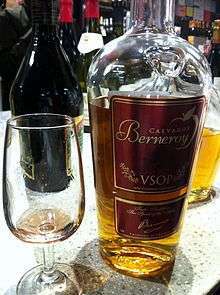 Calvados can be served as an apéritif, blended in drinks, between meals, as a digestif, or with coffee. Well-made calvados should naturally be reminiscent of apples and pears, balanced with flavours of aging. The less-aged calvados distinguishes itself with its fresh apple and pear aromas. The longer the calvados is aged, the more the taste resembles that of any other aged brandy. As calvados ages, it may become golden or darker brown with orange elements and red mahogany. The nose and palate are delicate with concentration of aged apples and dried apricots balanced with butterscotch, nut, and chocolate aromas. 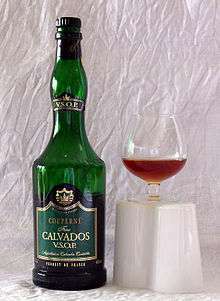 Calvados is the regimental drink of The Royal Canadian Hussars, Le Régiment de Hull, and Le Régiment de Maisonneuve, having been taken up as the units passed through Normandy following the D-Day invasion. Known as le trou normand, it is normally taken between courses at a regimental dinner. ↑ Mattsson, Henrik (2005). Calvados: the world's premier apple brandy : tasting, facts and travel. p. 27. ISBN 91-631-5546-X. Retrieved 30 September 2013. ↑ Morris, Steven (15 September 2011). "Victory for Somerset as cider brandy wins protected status". The Guardian. Retrieved 2 November 2011. ↑ Asimov, Eric (October 31, 2011). "The Flavor of Apples and a Sip of Fall". The New York Times. Retrieved 30 December 2011. Wikimedia Commons has media related to Calvados (spirit).